Description: This webinar will review your ability to create a Risk Assessment in a matter of hours with Expresso. All Covered Entities and Business Associates are required to implement a Risk Management program. Performing a Risk Assessment is the first step in that process, but many organizations are overwhelmed because it is difficult to know where to start or how to complete the process. In fact, the prospect of starting a Risk Assessment from a blank page or from convoluted spreadsheets can be so daunting that many organizations procrastinate until it is too late. Don't wait for a breach or an audit to get started; get started with Expresso! What is Expresso? Expresso is a software-as-a-service ("SaaS") that embodies the National Institute of Standards and Technology ("NIST") seven (7) step process for performing Risk Assessments. Expresso comes pre-populated with (T)hreats, (V)ulnerabilities, and potential business (I)mpacts to your organization-making the calculation of (R)isks easier than the tedious process that our competitors offer. In addition to pre-populating Threats, Vulnerabilities and Impacts, Expresso comes pre-populated with Controls the cover all Security Rule implementation specifications. Expresso also allows you to modify all pre-populated data in a manner that best fits your organization. In short, Expresso builds on the NIST foundation to facilitate performing Risk Assessments by rationalizing the NIST methodology in a manner that makes it accessible to lay persons. Expresso does for Risk Assessments what QuickBooks Online ("QBO") did for accounting. QBO did not eliminate all the work associated with accounting, but transformed accounting from a necessary evil, something to be avoided at all costs and/or handed over to a third party, to something that a business person could master at some basic to intermediate level. Expresso similarly allows you to gain a level of mastery over Risk Assessments. is based on an authoritative methodology (e.g. NIST SP 800-30) so as to meet regulatory compliance objectives. Expresso "productizes" the equation and the process that emerges from the NIST methodology as depicted in the graphic below. 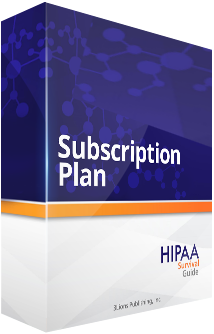 It is sold as part of the HIPAA Survival Guide's Subscription Plan. Much, much more, including a UI that was built for ease of use and clarity that increases your Risk Assessment productivity on day one. There are no specific requirements with regard to: (i) the formality, rigor, or level of detail that characterizes any particular risk assessment; (ii) the methodologies, tools, and techniques used to conduct such risk assessments; or (iii) the format and content of assessment results and any associated reporting mechanisms. Organizations have maximum flexibility on how risk assessments are conducted and are encouraged to apply the guidance in this document so that the various needs of organizations can be addressed and the risk assessment activities can be integrated into broader organizational risk management processes. Therefore, the most important thing you can do with Expresso is to get started--which means as a practical matter that you likely won't have all your Security Objects loaded nor every potential Threat/Vulnerability pair identified. The requirement is that you make a "good faith" effort to perform a Risk Assessment and that you continue to improve on the rigor and quality of your assessments going forward. It's critical that all stakeholders, from the C-Suite to the most recent addition to your Workforce, recognize the importance of performing regular assessments. The threat landscape is changing much too quickly for Risk Assessments to be seen as merely an Information Technology issue. In fact, the consensus is that such a narrow view of Risk Assessments is likely to fail. You can't manage what you don't measure--at least not in a competent and professional manner. A Risk Assessment is an analysis step where you identify Security Controls to be implemented in order to reduce Risks levels to those that are "reasonable and appropriate" for an organization of your size, complexity, etc. It stands to reason that once you have identified the required Controls you must implement them as part of your Risk Management program and subsequently track their effectiveness. Expresso allows you to easily update the status of a Risk once the implemented Controls have yielded results. 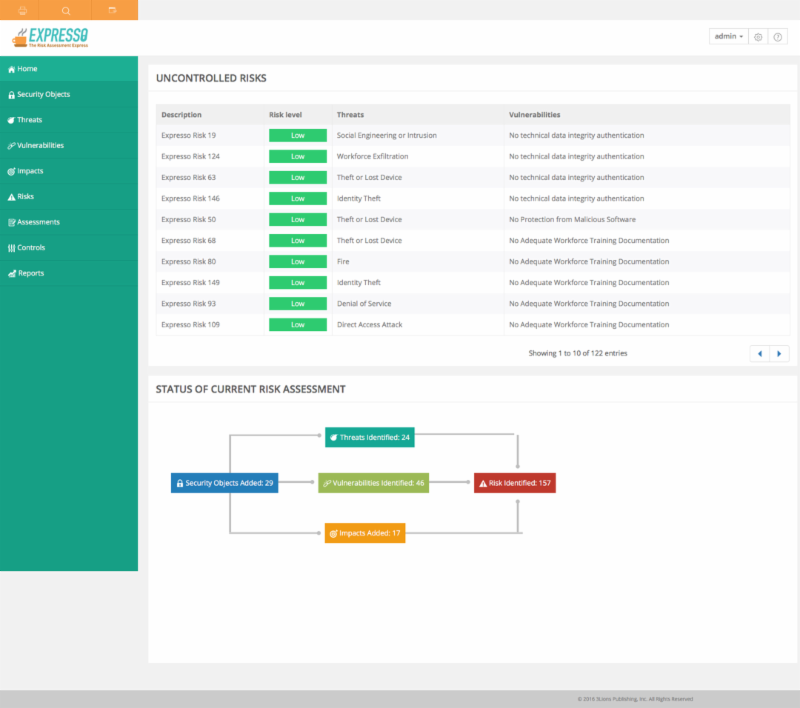 Expresso dramatically reduces the pain associated with performing Risk Assessments and provides the internal and external reports necessary to show visible demonstrable evidence of both regulatory compliance and a commitment to protecting unauthorized access to your information. 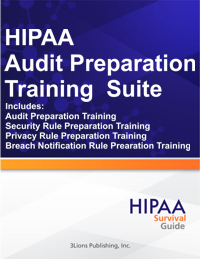 HIPAA Audit Preparation Training NEW! Copyright © 2016 3Lions Publishing, Inc. All Rights Reserved.